New years is the biggest celebration of the year in Japan. The Japanese word for it would be お正月, read O-shogatsu. New Years follows the Chinese Zodiac system, which makes 2017 the year of the Rooster, as seen in the header image of this blog. As it is such an important event, there are a lot of different customs and traditions that go with it. Hence, today, I would like to share some of them with you in what is probably going to be one of my longest blogs yet. Sit back, relax, and enjoy. The last day of the Year is probably the second most important day of the year. In Japanese it would be 大晦日, read Omisoka. There are quite a few traditions for this day, perhaps the biggest and most common being eating Soba noodles, a special type to be precise, toshikoshi-soba noodles [年越しそば]. These are a symbol of long life and strength, as the noodles themselves are very long and the plant can survive even the most severe weather conditions while growing. Another theory about this tradition is that by eating these long noodles, one is crossing over from one year to the next. Either way, you get to eat soba, and I like soba. Eating soba past midnight is seen as bad luck though. A modern tradition is watching the Kōhaku Uta Gassen TV program on NHK. It is broadcasted in the evening and is one of the most popular TV programs of the year. The English name for it would be the “Red vs. White singing contest”, which is practically what it is, popular singers and music groups split up into two teams, women in red, men in white, and compete throughout the evening [until roughly 11:30]. I didn’t actually watch it, however when I went back to school a few days ago a lot of people asked me if I did, and which act was my favourite. 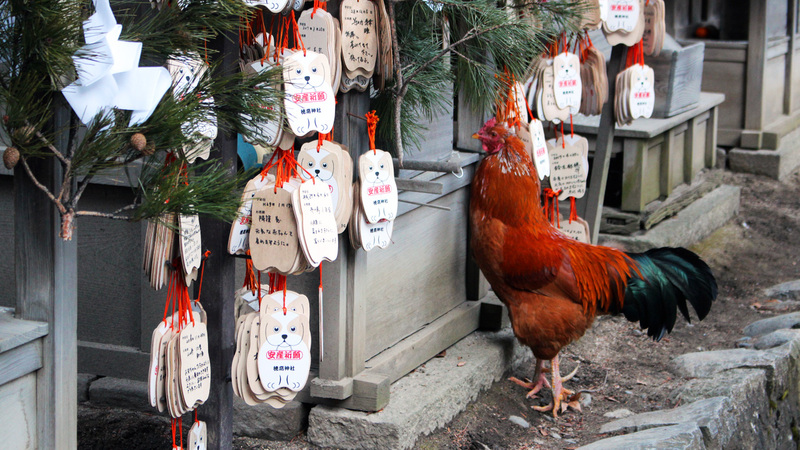 Just before midnight, all temples in Japan will ring their bells 108 times, as a way to ring in the new year. The reason for the bell-ringingis to forswear the 108 human desires. As per Japanese tradition, the women in the family prepares this bento like meal for the following three days, as historically, it was [mostly] taboo for women to cook during the first three days of the new year. By Japanese tradition, I mean of course the terrible gender inequality here in Japan, which ranks 111 out of 144 countries. If you feel like not preparing any food, you can of course buy ready-made O-Sechi at your local supermarket or convenience store. O-Sechi is a shortening of Osechi-ryori, or お節料理. In O-Sechi you can find many different traditional foods, each with their own traditions and meanings. What you put inside is very flexible, and can be arranged in a variety of different ways. The traditional set consists of 3 boxes, which are stacked on top of each other when not in use. In the image above you can see 5, but that is just because we had 2 sets, you may notice 2 of the tiers are identical. Since there are so many different kinds of foods, I’ll just link you to a page that describes them all in a nice list instead of attempting to that here. It is part of the tradition to create rice cakes, or mochi [餅] shortly before New Years and to eat them during the beginning of January. For New Years, a special type of mochi called Kagami mochi [鏡餅] are made which consist of two round rice cakes with a Japanese Daidai on top. They are placed at various places throughout the house. Another tradition in Japan is to watch the first sunrise of the new year, as it is seen to bring good luck. If you want to read more about this tradition, I’ll link an article by The Japan Times here. I am very sorry about how shaky the video is, I hadn’t planned on making a time-lapse, and I also didn’t check if my tripod was standing stably. The video shows the sun rising over lake Suwa, with mount Fuji in the background. Kakizome [書き初め], which literally translates to “First Writing”, is the first calligraphy done during the new year. They are written on January 2nd. Traditionally it would be a poem or the likes, but nowadays it is often just a few Kanji. Students often have to practice their Kakizome as homework during the winter break. They are usually burned on January 14th, and it is said that if the paper flies, you will be able to write more beautiful calligraphy. Below are some of the Kakizome I wrote. There are quite a few games that are traditionally played during Japanese New Year. One of the most popular are the playing cards called Karuta which are a set 0f 100 poems, 200 cards total, and the most common game is called Uta-Garuta, in which you use the Karuta cards. The game is played by having somebody reading the poem from one of the reading cards, and having two players grab the matching card that completes the poem. If you want to be good at this game, you have to memorize all 100 Waka [Japanese Poems]. There are however easier games to be played with Karuta. Another popular game is called Sugoroku, which is a board game and purely a game of chance. There is a badminton like sport called Hanestuki that is also very popular. These games used to be a lot more popular, yet now they seem to only still exist as a New Years tradition. Another big tradition is to visit your local shrine or temple. Even people who do not normally go do so during New Year’s to pray for things like their own and their families health. And by that I mean a LOT of people. As everything during New Years has a special name, the one for the first temple visit of the year is called hatsumode, 初詣. During this time is when you purchase new Omamori, which are Japanese amulets, such as charms or talismans. Another must buy is O-Mikuji, 御御籤. Translated they mean “Sacred Lot”, which is a good name, as that is what they are. Random slips of paper which include a type of blessings, ranging from Great blessing [dai-kichi, 大吉], all the way to Great curse [dai-kyō, 大凶], with around 12 in total. My first O-Mikuji was a dai-kichi, which is pretty rare, so, yay. There are a lot of different fortunes on the bottom half of the paper, which have things like travel, illness and the likes. Daruma dolls are round, traditionally red dolls that are said to bring good luck and fortune to whoever owns them. When purchasing a Daruma doll, which is usually done around New Years, one colours in one of the eyes and makes a wish or set a goal. Then, when this goal is accomplished or the wish comes true, one colours in the other eye as well. A few days after new years there is the Daruma burning, in which the dolls from the previous year are gathered and then set aflame. This event is called daruma kuyo, or だるま供養塔 in Japanese. Where I live it was held on the 9th, which is one of the reasons this blog is a bit late. Congratulations on the national championship. Happy new year as well. What an amazing celebration. What happens to the dolls if the wish doesn’t come true? The January letter will become the February letter for reasons to be explained in it. Thanks for your blog efforts, even if you are tired, I am loving it! If the wish doesn’t come true, they are also gathered the following new year for daruma kuyo, daruma burning, and are burned with one eye.